Doors that are opened and closed by machinery. Most often a sliding door that is triggered by an electronic sensor. A sliding door unit with two sliding panels, moving in opposite directions providing one door opening. 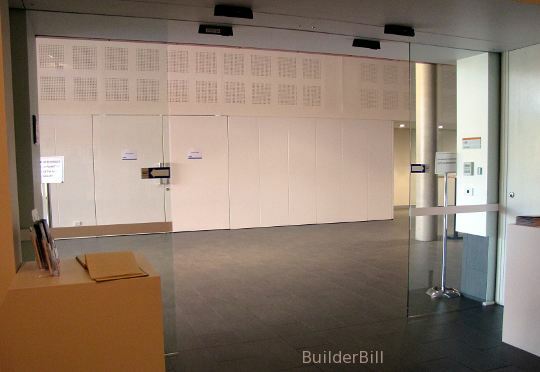 Automatic Sliding Doors : Aluminium framed glass doors. This common layout of two doors opening at the same time to make one larger opening is also know as a Bi-Parting-Sliding-Door. Most doors like this are activated by a movement sensor fixed somewhere above the door. On the fascia cover or the ceiling. You can't see the sensors for the pair of automatic doors above, but the give away is the fact that there are no handles. Also a requisite for most doors like this is a separate activation button for use in emergencies. 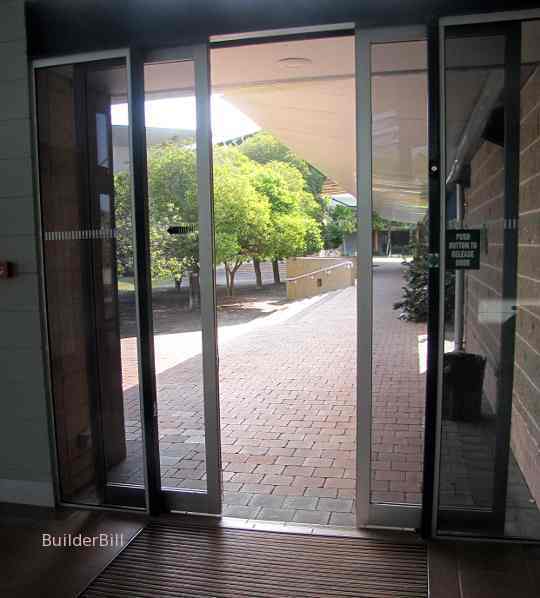 Automatic sliding Doors : Frame less glass doors. The doors above would be a quite expensive option. They are unframed glass panels that slide back into pockets in the walls. In addition all the running gear, the hangers and automatic mechanism is hidden inside the ceiling. The doors are in the act of closing and the two sets of sensors are clearly seen fixed to the ceiling.